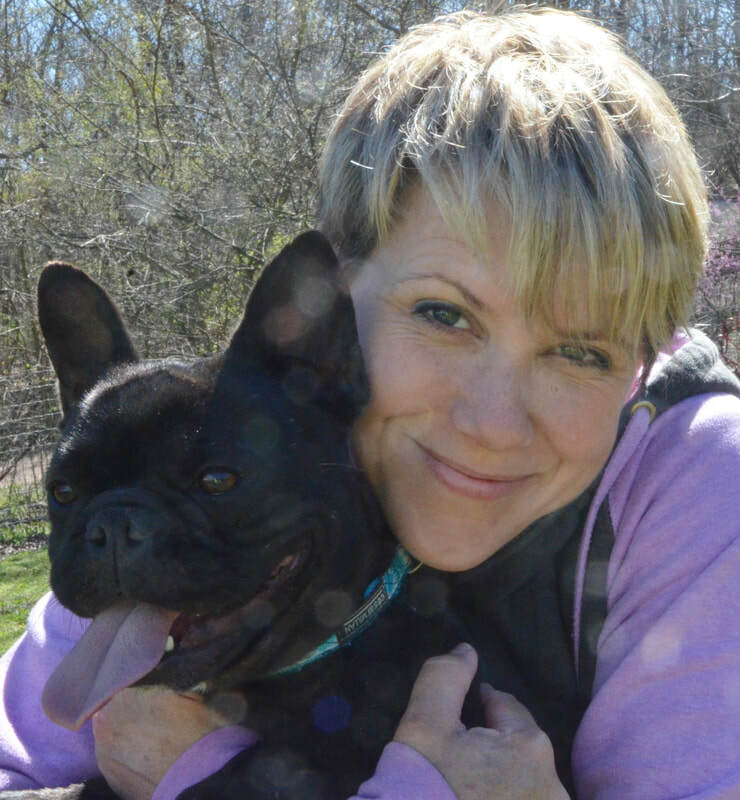 My name is Casey Zimmer and I am a French Bulldog Conservationist, meaning I raise French Bulldogs and try to preserve the traits that I believe make the breed so adorable. I fell in love with these little rollie pollie dogs and I decided this was "It" for me! And that's where my addiction began...and it's still going strong. My goal is to breed healthy, quality French Bulldog puppies, that are prepared for an easy transition to your home. My breeding program is based on not only the physical features that I find attractive, but also on the structure that should keep your pet and companion healthy into old age. And that is a balancing act. Each adult dog has had numerous health checks and screenings completed by my veterinarians as they grow from puppy to adult. And each time they produce puppies, the puppies are examined to assure that the parents are producing the best attributes possible that we can measure under 8 weeks of age. Each adult is continually accessed for how they fit into my breeding program. I want to know that 1.) each dog is happy (i.e. happy living in a kennel, getting along with their "room" mates, likes having puppies & "mothering", etc.) 2.) each dog can handle the physical strain of reproduction (i.e. the adults "bounce" back to a normal weight, coat, & eating habits within two months after the weaning of a litter of puppies or for the studs, within two months of a heavy breeding cycle). As the adult dogs age, all of these factors can change and with the mothers, things can change litter by litter. This is why I am accessing each dog for their whole time with me. I like to retire my adults by four years of age so that they can enjoy the majority of their life as a loved family companion and couch potato. Sometimes retirement comes earlier than expected, which is why I often hold back puppies for myself. In every litter I breed, there is a potential breeding candidate for the next generation and each cross is meant to move my breeding program forward. Each breeding is an experiment to see if the physical traits or bloodlines of the parents will hold true and will show up in the next generation. It takes no special skill to just breed an average French Bulldog and I am not interested in producing the "average" Frenchie. Being a truly good breeder is very much a special combination of knowledge, skill, and having an "eye" for a well put together dog (even if you can not put what you are looking for into words). Breeding a superior French Bulldog is an art and my passion. Here are some pictures of my dogs and puppies. To look at puppies that are currently available, please go to the "Available Puppy" page above. First, I have a Bachelor of Science in Biology and am certified to teach Jr & Senior High School Science. My degree was based in pre-medicine which dovetails perfectly with raising French Bulldogs. To successfully raise these rollie pollies, you have to become a reproduction specialist and definitely have a good understanding of genetics! My background also makes it easy to have logical and informed discussions with my veterinarians. Second, I am very proud to say that I am a Licensed Professional Show Breeder. I am licensed and inspected through the Missouri Department of Agriculture. The inspections are preformed on a "drop-in" basis, meaning that I could be inspected at anytime and I need to be ready for an inspection at all times. These are not appointments and the State of Missouri has the toughest commercial kennel rules of all fifty States. When you contact other breeders, please understand that not all breeders have the same rules and requirements. Some will be required to be licensed through their State and the USDA, some will not fit and will have absolutely no over-site at all. I choose to NOT be USDA licensed and do NOT ship any of my puppies "sight-unseen" by cargo flights to the new owners. I will meet the puppy buyers at my airport or my vet's office during normal business hours. I no longer allow anyone to come to my kennel. This is for the buyers' and my safety. Both places that I do meet buyers with puppies are public places with plenty of unbiased observers. Third, I have also been inspected by the American Kennel Club and am an active participant of the Bred with H.E.A.R.T program. When the AKC inspector came, she looked to make sure that my dogs met the breed standard, that they were healthy and socialized, my paperwork was in order. My dogs would have crawled all over her if only she would have sat on the floor! :) Also, I do show my dogs. This is mainly for my own personal satisfaction in knowing that I am breeding a certain level of French Bulldog. My dogs have been shown in AKC, APRI, and ACA, and are sometimes handled by myself, a family member, or by a professional handler. Fourth, I think that continued education is important for a successful breeding program. I have been involved in breeder associations, locally and state-wide in the past. Unfortunately, that takes a lot of time away from my responsibilities at home and in my kennel. I have taken a break from adventuring too far away, although I am still very politically active. I still achieve 20+ hours a year of continued education. There is new research that is being developed everyday and it is just as much up to me to be informed as it is up to my veterinarians. I am in the process of building a new kennel and will be posting pictures as we break ground and complete the building. I am very excited to actually start and be done with the "planning" stage! FYI-I use the Strafford Veterinary Clinic in Strafford, Misssouri for all my veterinarian services and you can look them up on Facebook. They have so much information on canine disease. © www.noblefrenchies.com, from 2009 to present.